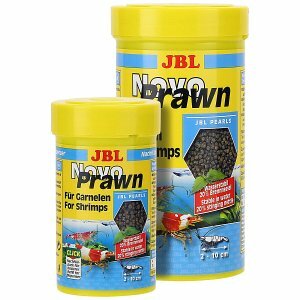 For keeping and breeding dwarf shrimps, another crucial factor is the right food. The feeding habits of shrimps differ quite significantly from those of fish. They constantly graze on all surfaces inside the aquascape or aquarium, searching for food. Their entire digestive tract has adapted to a constant food supply, and they cannot store large amounts of food to slowly digest them. Thus, shrimp food needs to be completely different from fish food. It needs to be stable in the water for a long time, and it should attract the shrimps for a long time, too. 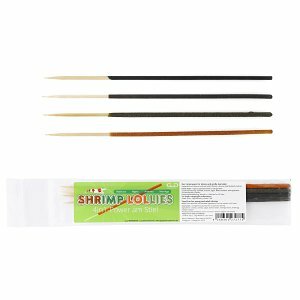 These properties ensure that the shrimps keep grazing on their food, thus providing them with an optimally balanced nutrient supply. Baby shrimps need special baby shrimp food in addition. Very finely ground foodstuffs provide them with all the nutrients they need and guarantee an optimal supply during development. 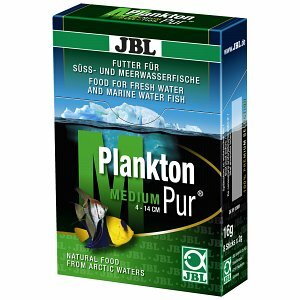 In this shop category you can buy high-quality shrimp food that provides your little crawlers with all the nutrients, vitamins, minerals and trace elements they need for a healthy and long life, great colors and successful reproduction. 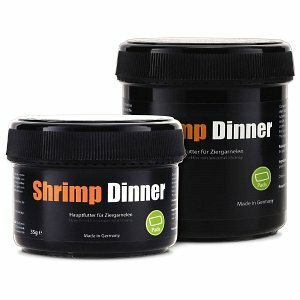 You can look up the composition of high-quality shrimp food in our Wiki article Feeding shrimp properly. 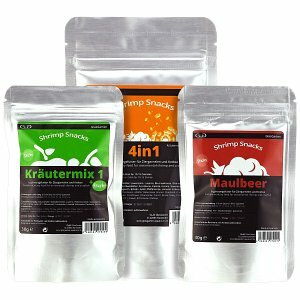 Here at Aquasabi's online shop you will find a wide range of different food for your aquarium's dwarf shrimp: Mineral food for a good shell structure, protein food to cover the protein requirements of the small crawlers, balanced staple food for your dwarf shrimp, color food to support an intensive coloring and also dust food as a breeding food for the youngest, which distributes itself well in the aquarium and is available to even the smallest baby shrimp that are not so mobile, yet. 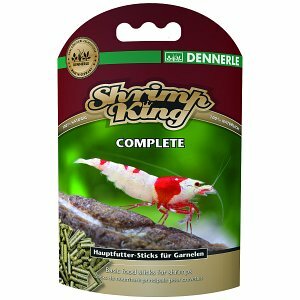 You can buy the popular GlasGarten brand foods like Shrimp Dinner Pads and Granules as staple food, Shrimp Baby Dust Food and also the popular Shrimp Snacks - as well as the carefully compiled Shrimp King series from Dennerle. 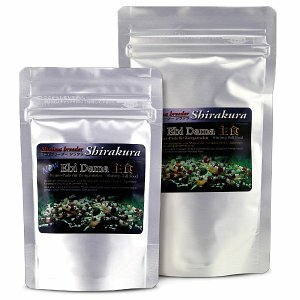 We also offer shrimp food from Shirakura: Chi Ebi rearing feed: Ebi Dama and Ebi Dama Special. 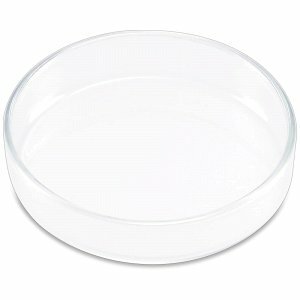 To keep your shrimps from dirtying the aquarium with food crumbs, you'll also find shrimp feeding accessories here: shapely feeding dishes made of clear glass, feeding tubes for the exact placement of food pearls and food pads, as well as the Glass Feeder and Food Glass from ADA. You can read about the advantages and the exact handling of food bowls in the aquarium in our article Feed tray for shrimp in an aquarium in our Aquascaping Wiki.